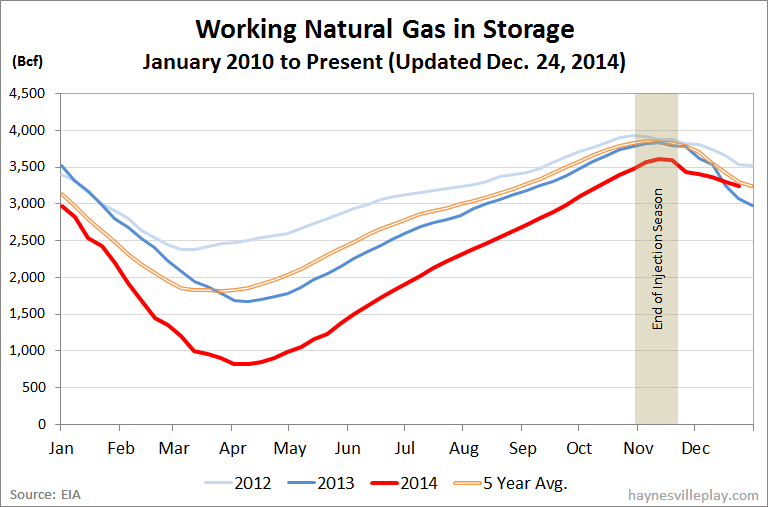 The EIA reported this week that working gas in storage was down 49 Bcf to 3.246 Tcf. The weekly withdrawal was only a quarter of last year's (-193 Bcf) and 64% below the five year average (-138 Bcf). The market reacted strongly to these numbers, as the price of gas dropped precipitously during the week, with the Henry Hub spot price finishing at $2.74/MMBtu. The current storage level is now 4.8% above last year (3.096 Tcf, a difference of 150 Bcf) and 4.9% below the five year average (3.415 Tcf, a difference of 169 Bcf). Given another disappointing storage report like this one and the difference between the current and average will be wiped out, erasing a 60 percentage point difference from back in April.